It’s the New Year, which means we’re all watching what we’re eating or at least trying very hard to make the right decisions when it comes to food. This doesn’t mean that we have to give up on taste though. Let’s not call it a diet, because diets aren’t a very good mindset to have. What’s more I don’t even think we should even call them resolutions. Let’s focus less on what we won’t be doing this year and focus more on what we will be doing. I’m all about the un-resolution. This year we should reintroduce ourselves with our love of food and remember that it’s not at all what we shouldn’t be eating, but rather it’s all about eating what we want…in moderation. That’s the key. Maybe this means eating somewhat healthy during the week, and cheating during the weekends. That seems like the best plan to me. This French Lentil Stew with Sausage for instance, just happens to be a healthier option to the guilty comfort food we’re all use to in winter, but it’s filling and warming and won’t make you feel like you’re over-indulging. This recipe is inspired from my favorite dish from a tiny French restaurant in Austin, Texas called Chez Nous. A lentil stew packed with so much flavor and topped with roasted tomatoes, grilled house-made sausage and a lightly (but perfectly) dressed mixed green salad. It’s heaven in a bowl, and you’ll want that bowl to never end. Trust me. Julian and I love a good cobb salad. Now there’s a salad to end all salads. Bacon, eggs, cheese, tomatoes, avocado, chicken and lettuce. That’s a salad I can get behind. It’s like let’s put everything and the kitchen sink on top of some lettuce and call it a day. I’m not complaining. It’s an entire meal on top of leaves, so it’s definitely healthy. That’s how this works, right? Just place anything on top of lettuce and you know you’re making the right choices in life. If we ever see a cobb on a menu, you better believe we’ll be ordering it and because I’m not classy at all, I also order a side of croutons. I don’t know about you, but I can’t have a salad without croutons. I know that croutons aren’t at all traditional when it comes to cobb salads, but I can’t help it. Cubes of toasted bread are just irresistible, let’s face it. We also ask for the blue cheese on the side because I’m not a fan, but Julian can’t get enough of it so he can add it to his portion. For this month’s collaboration with Go Bold With Butter, I decided to take my favorite salad and give it a seasonal twist. Spring is all about the fresh vegetables that are just calling out to be eaten. So I grabbed a bunch of fresh spring vegetables and roasted them in the oven until charred and crispy. Then I placed them on a bed of butter lettuce and made an easy garlicy butter dressing to cover all the salad with because as we all know by now, butter is the answer to everything. I most definitely don’t have a problem drowning a healthy salad with a ton of melted butter. If you thought I did, then you don’t know me at all. The good news is that it’s incredibly easy to make so you can have dinner on the table in no time at all, but at the same time, the bad news is that it’s super easy to make. So you know what that means? You’ll be making it all the time and once you get a taste of that garlic butter dressing, you’ll want to add it on top of everything. This is a warning. It’s starting to get really hot over here in Los Angeles. Well in all honesty it’s been hot for a while now, but I’m just barely starting to notice it. The last thing anyone should be doing during this time of year is cooking in a hot kitchen for hours and hours. That sounds like torture. So to make things a little bit easier for us, I’m throwing this refreshing summer salad right at your face. Minus the standing over a hot grill/grill pan part, this is actually a quick and easy recipe that you can have ready in no time at all. The kind of recipe we need during the week. Sure, I have you grilling a few things along the way, so okay maybe we’re not avoiding the heat like I mentioned earlier BUT in my defense, the grilling part is super quick and the flavor you get from it is incredible, so it’s totally worth it. We can suffer for a few minutes all for the sake of food, right? Right. Have you ever had watermelon, mint and feta together? The combination is out of this world delicious. The kind of thing that upon first hearing about, you’re skeptical, because it sounds super suspicious so you eat it with caution, but three bites in and you’re hooked. It’ll be the best thing you’ll taste all summer trust me. When you throw grilled shrimp into the mix, all bets are off. Go home because this salad has just won at life. It was inspired by a salad I just recently tried at a restaurant. I won’t mention the name of it because it’s the type of establishment you’re embarrassed to admit you’ve eaten at. We don’t need to dwell on that piece of information though, let’s move on. Anyhow, the salad had mixed baby greens, watermelon, feta and a mint honey vinaigrette and it was everything I never knew I wanted. The watermelon was really refreshing because it was super cold and added a great texture to the salad, along with the salty bits of feta throughout. I know I’m going on and on about this salad (we get it Jonathan), but I was pleasantly surprised. So I decided to go home and give it a go and try to make it myself like the restaurant’s version, but completely different and nothing like the original. I know that 99.9% of the time I’m posting decadent recipes on here, packed with butter, sugar, chocolate, caramel, cheese and cream. And that was all just a couple days ago with that Chocolate Butterscotch Hazelnut Cake! I don’t get tired of posting these tempting recipes because A) they make us all happy and B) it’s not like I’m telling people to eat them every single day of their lives. Every other day…sure. I think it’s totally fine to have some fun once in a while and when you want to have said fun, you can stop by this site and let loose. I’ll still be here tempting you. Let’s live a little. There are so many people out there already that take themselves too seriously when it comes to food, so we definitely don’t need one more person posting diet recipes and telling you what you should or shouldn’t be eating. Sure, I don’t always post a healthy recipe on the site, but hey when I do, it makes them that much more special. That 00.1% of the time a healthy recipe does make an appearance, it’s refreshing because it occurs so infrequently. 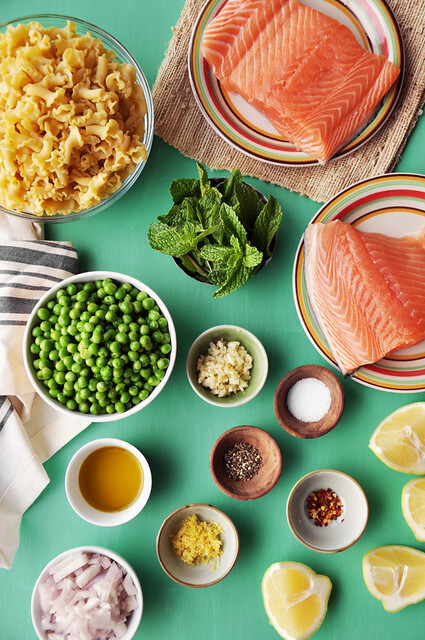 Although I’ve turned to the dark side and sold my soul to a healthy recipe this time around—it has peas and salmon in it, which is packed with good-for-you omega-3 fatty acids by the way and it’s as healthy as I’m going to get so enjoy it—I didn’t forget my sinful roots completely. I tossed in some pasta because I couldn’t help myself. I don’t think I could ever just go cold turkey on the entire comfort food situation. And let’s be honest, I wouldn’t be much fun if I did. With the New Year though, I figured it was time to explore some healthier options and do some good in the world by sharing a delicious healthy recipe. Can you blame me? It’s my good deed for the year. I’ve partnered up with Nikon USA to bring you this healthy recipe and also to talk about the New Year and all of the possibilities that come with it! I feel like 2015 is going to be a MEGA great year for all of us. Let’s look forward and do the very best we can, even if the very best means failing a couple times along the way until we succeed. No one is keeping tabs on how many times we slip, but they are taking note of all the good we’re doing. In the end, that’s all that really matters. 2015 is your year. Shine bright like a diamond (sorry Rihanna). It’s okay to make healthier choices and to want to change certain aspects of your life through resolutions and what not, but don’t let it dictate your life. 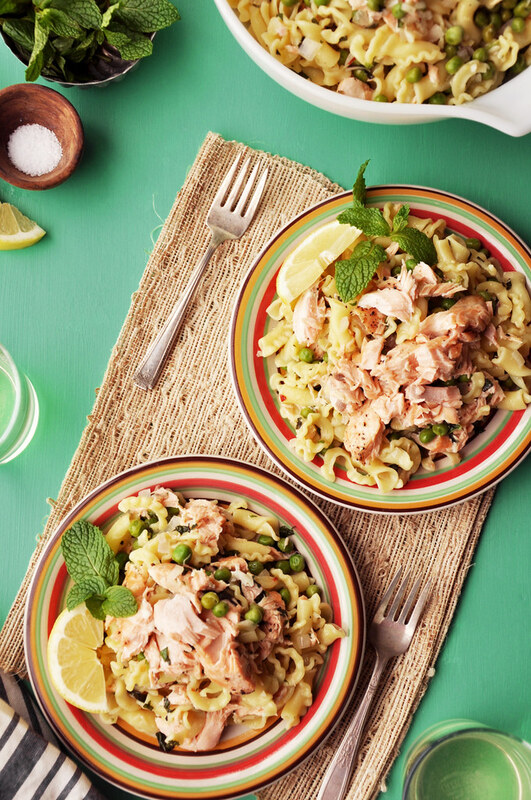 There’s still plenty of doughnuts, cake, cookies, and potatoes to devour, but first, we have to eat all of this healthy Salmon, Mint and Pea Pasta (it’s actually ridiculously delicious).